The Crocodilians Worksheet – Download this free easy science worksheets puzzle game for kids. This fun science activity sheet about Crocodilians includes a fun search a word game as well as a hidden and missing words puzzle. Our free to download and print worksheet is suitable for Pre-K kids, Kindergarten kids as well as Grammar school kids in 1st Grade to 5th Grade. Kindergarten kids and Preschoolers can enjoy this easy science worksheet as a listening comprehension worksheet while learning fun facts about Crocodilians. Young kids who cannot read yet can still have fun playing the word search puzzle game while learning to recognize hidden words and letters. Grammar & Primary school kids can use this as a reading comprehension worksheet. Educators and teachers can use our free printable easy science worksheets for science enrichment classes, after school enrichment programs and for homeschooling activities. Parents can use our hidden words puzzle game about the Crocodilia family to spend quality time with their children while teaching them fun science facts. Our science made easy for kids website offers many more free downloadable puzzle games for kids and printable easy science worksheets. What are Crocodilians? The Crocodilian family includes alligators, crocodiles and gharials. Crocodilians are in fact reptiles. All these reptiles have long snouts, sharp teeth and keen hunting skills. What are the differences between different members of the Crocodilia family? Download the word puzzle game to find out more fun facts about the Crocodilian family and learn Crocodilian characteristics and about the different Crocodilian species! [sociallocker]Download FREE Easy Science Worksheet about the Crocodilia family. Download the FREE Crocodilians Worksheet! Did you like the FREE Crocodilians Worksheet? Find lengthy information about the Crocodilians here. Declan, Tobin. " Crocodilians - Free Easy Science Worksheets Puzzle Game - ." Easy Science for Kids, Apr 2019. Web. 21 Apr 2019. 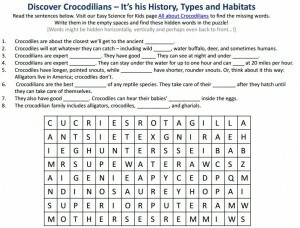 < https://easyscienceforkids.com/crocodilians-free-easy-science-worksheets-puzzle-game/ >.